One challenge marketing and web professionals have is to unpuzzle Google’s latest move. A tedious form of job security, perhaps. On occasion, Google broadcasts big changes in advance. They don’t want any ambiguity and their announcements aren’t idle warnings. When they make an announcement, it’s best to pay attention and follow directions. This is a critical issue which must be resolved by January 2017. Any site deemed ‘insecure’ will display “NOT SECURE” on Google Chrome browsers. In a nutshell, Google wants a more secure internet. Website owners must provide a secure experience. Any site that does not conform to Google’s guidelines will be flagged as insecure if the visitor is using Google Chrome. If your site is HTTPS, you’re covered! If you perform your own website maintenance, here’s the straight scoop from Google. If you have professional hosting and WordPress maintenance, check in. Learn the details of how this will be addressed for you. Will there be any extra work or additional costs? When will the changes be implemented? Ask to make sure the changes are adequate and will be implemented before January 2017. Depending on your host, this could be a quick, painless change. Some hosts may charge extra to add an SSL certificate to your site and enable HTTPS on your account, so it pays to find out the details. This is a major step towards transitioning sites from HTTP to HTTPS. Your search results rankings will be affected depending on your site’s status according to Google. This is huge for SEO (search engine optimization). Insecure websites will be hurled into the search results abyss. Plenty will heed Google’s warning, including your competition. Site owners ignoring this new guideline do so at a huge risk. Insecure sites can expect a demotion in any hard-won search rankings and a sharp decline in visitor traffic. And guess what? Google already rewards sites that use a secure certificate (HTTPS) with higher rankings. Eventually, all websites will be secure (HTTPS). If people see a stern message “NOT SECURE,” a goodly chunk will bolt. What about Internet Explorer (is that still a thing?) or Bing? So the data above shows what people use to access websites like yours. If most of your traffic comes from visitors using IE or Bing, we have to talk. But for fun, let’s say this is true. Sure, you can ignore this guideline, but should you? HTTP vs HTTPS is a security issue. One that should have been quashed years ago. It will only be a matter of time before the other browsers follow suit. There just isn’t a good reason avoid this. The other issue in this scenario is your search rankings. Think the percentage of people using Google Chrome as their browser is high? Hold onto your hat because the search engine of choice in the US and globally is… Google. Just look at the search engine of choice on mobile and tablet devices. Yeowza! Acquire and setup an SSL certificate and keep it up to date. They typically renew every year or few years, depending on which one you choose. There is almost always a fee for obtaining or renewing your SSL certificate. Make sure it’s been installed correctly on your website. If you prefer to let a professional service manage this for you, make sure that security maintenance is included in the service. This is a critical issue which must be resolved by January 2017. Any site out of compliance can kiss those sweet search results goodbye. This is another issue that has been a long time coming. Google’s algorithms are smart. They understand that pop-ups are annoying. Visitors accosted with a pop-up blocking the screen bounce. High bounce rates tell Google something sub-optimal is going on. Again, this comes down to a solid user experience. 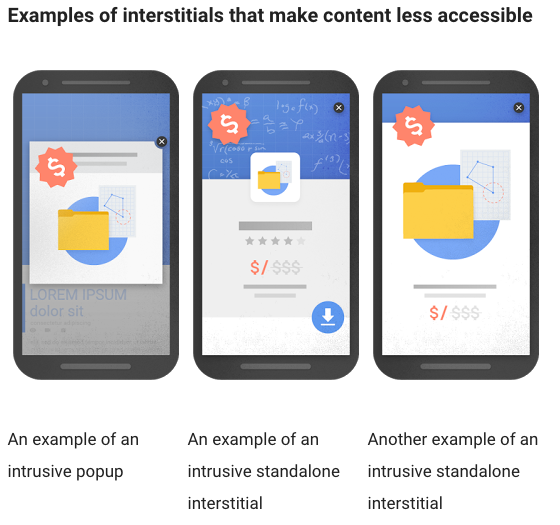 The specific pop-ups addressed by Google are “interstitials.” These are pop-ups that block content immediately, or upon clicking on a navigation element (to go to another page). It’s especially heinous if you’re using a mobile device. Will all pop-ups be penalized? Nope. Pop-ups are bothersome on any device. They are particularly torturous on mobile devices. Mobile search use continues to climb (see screenshots above). Google isn’t about to allow bad experiences on handheld devices continue. So what are the new rules? 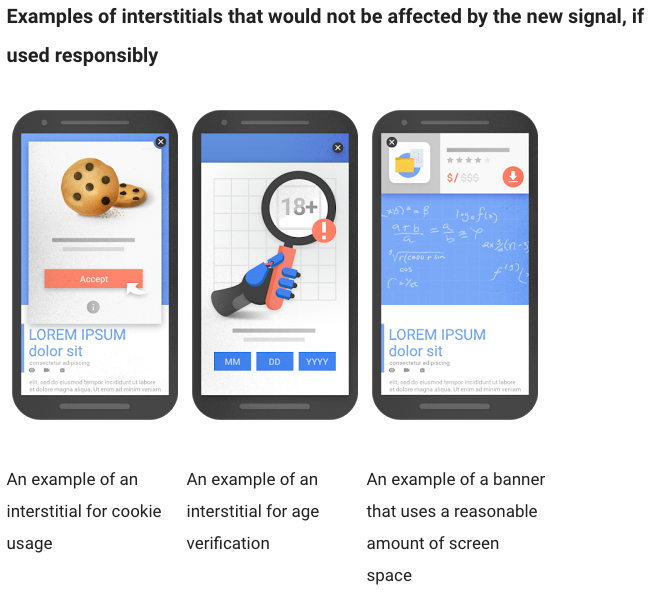 Actually, Google has done a fantastic job of illustrating which types of pop-ups, including placement, are acceptable and which types will be penalized. As you can see, this is about not standing in the way of the user and the content (unless there’s a good reason). Advertisers won’t like it, but Google rests on the side of user experience. Since mobile pop-ups are particularly painful, they’re addressing mobile first. Rank demotions will first impact mobile search. If you assume mobile search numbers aren’t as high as desktop/laptop, you’re wrong. We crossed that bridge over two years ago in the summer of 2014. Mobile search has overtaken laptop search. Mobile commerce is outpacing eCommerce by an astounding 300%. Reason enough for Google to start with mobile search results penalties before expanding to laptop search results. If your site has the type of pop-ups that Google will flag, give us a call. We can address pop-ups on your WordPress site and make sure they are within the new guidelines.